These tamperproof noticeboards with their fire rated felt finish are available in four attractive colours. With locking, hinged polycarbonate door or double doors on the two largest sizes. Satin silver anodised aluminium frames with rounded corners. 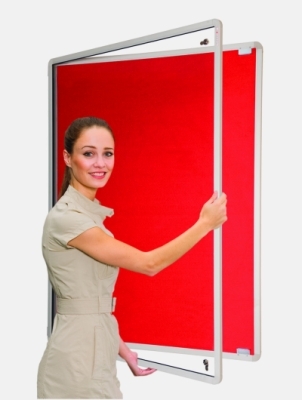 Single door models can be fixed either portrait style or landscape and the door is hinged to the long side. Twin door models can only be fitted landscape. Fitted with locking hinged, polycarbonate doors. Smaller boards will have 1 lock and the larger ones will have 2 locks.